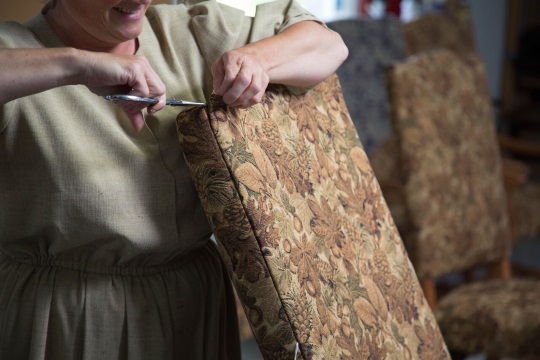 Amish furniture making may seem on first look like a male-dominated trade–and it is. But Amish women do some important work in the industry, as Milca Rivera of DutchCrafters shares in today’s guest post. As Erik noted in his post 5 Jobs Done by Amish Women, one of the types of businesses where you can find Amish women working outside of the home are woodshops. Most of the time they will be employed to work in the office. Their responsibilities include answering phones and emails (if the technology is available), processing purchase orders, billing, and bookkeeping. It is not unusual for the owner’s wife to work in the office taking care of the duties listed above and more. 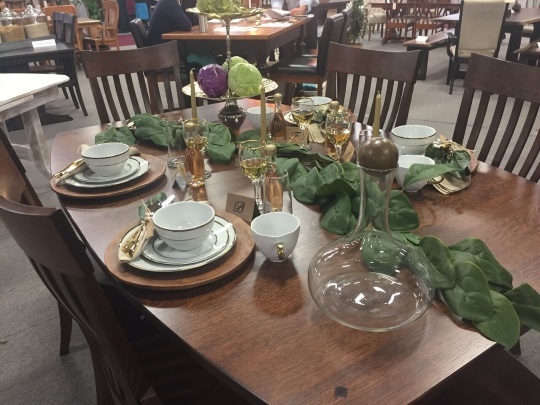 At a few shops, the owners’ wife also helps to design furniture, or plan, select, and even create the décor for the shop’s tradeshow booth. 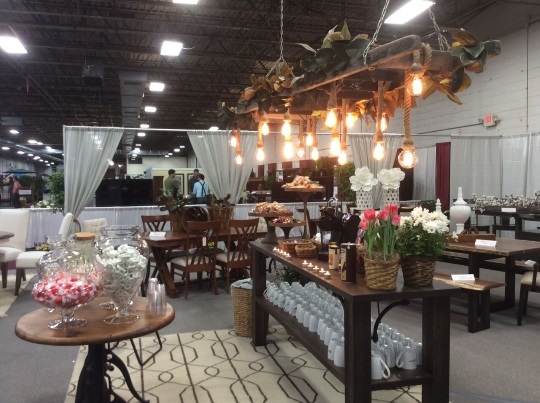 The rustic chandelier hanging over the coffee and snack bar, as well as table setting (below), were designed by the wife of the woodworker for their booth at a tradeshow in Indiana. 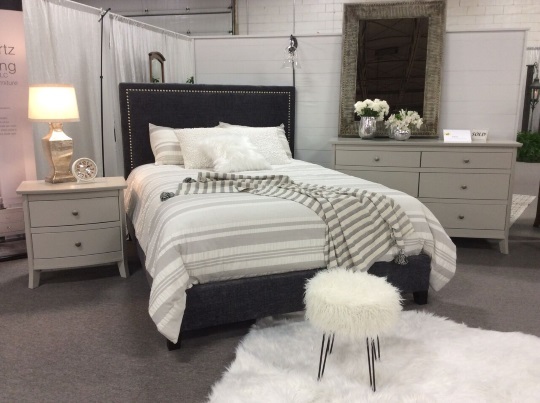 The wife of the owner of this bedroom furniture shop designed the scenes for their booth at the tradeshow in Indiana. 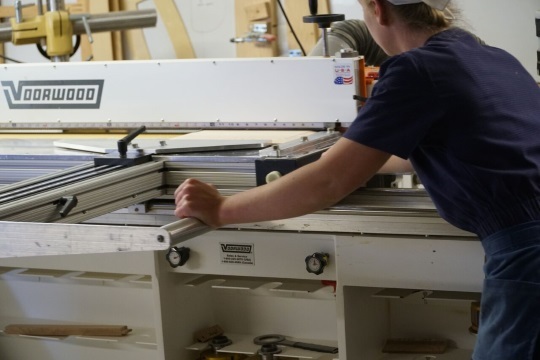 Woodshops will most often employ women in the office because many jobs in the shops are considered “too heavy,” according to one woodworking shop owner. However, like several shop owners, he does hire Amish women to help with inspecting furniture, as well as staining and finishing furniture – a multi-step process where the wood is stained, sanded, stained again, and varnished. “They are more meticulous and pay attention to details,” he said. Amish women working in the finishing shop. 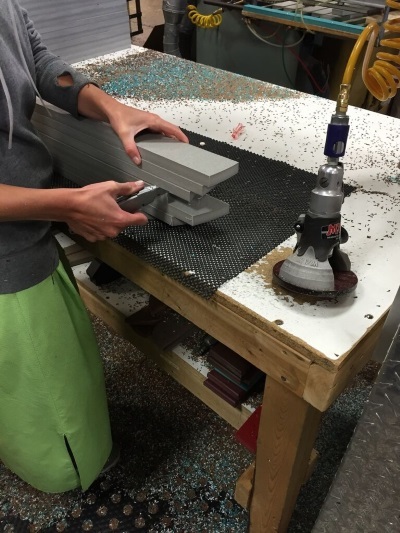 At a number of woodworking shops, you will find women pre-sanding and sanding. Pre-sanding includes removing large imperfections from the wood and creating rounded edges, while sanding prepares the wood for staining. Amish women pre-sanding chair rails. 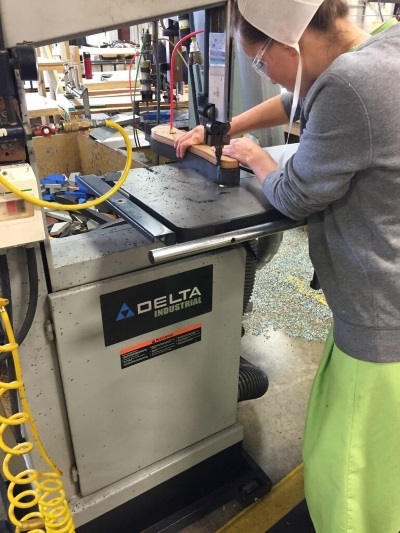 In addition to sanding and finishing, some shops have women do the finer details of final assembly, like hanging doors and installing drawer guides, as well as upholstering cushions and seating. An Amish woman hanging doors. 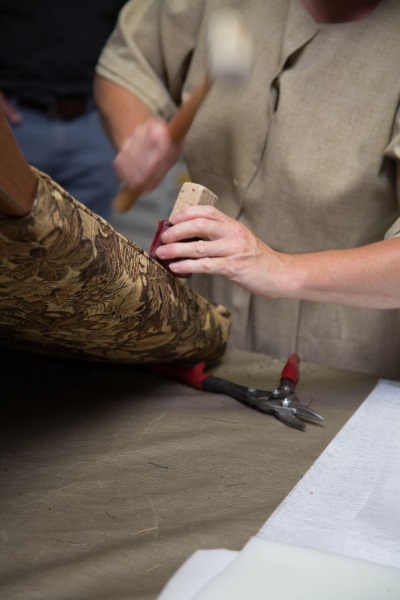 An Amish woman upholstering chairs at a woodshop. 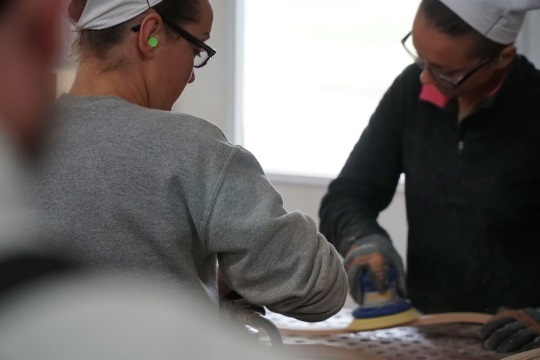 At Berlin Gardens, a manufacturer of poly outdoor furniture with Amish and conservative Mennonite employees, women are employed in various stages of the manufacturing process, as shown in the photos below. 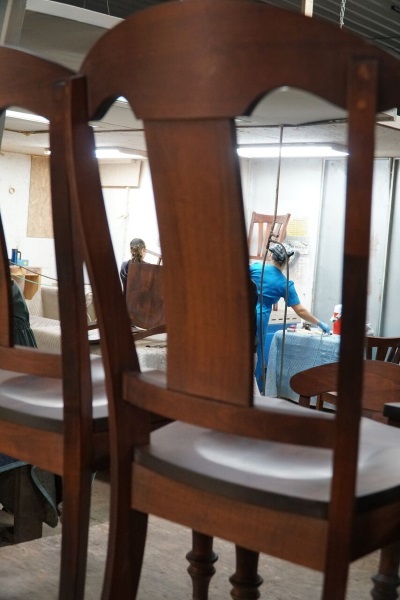 A woman cuts out arm chairs with the help of a mold and band saw. The same woman planes and rounds edges using a router. She then removes wisps of poly using a box cutter. 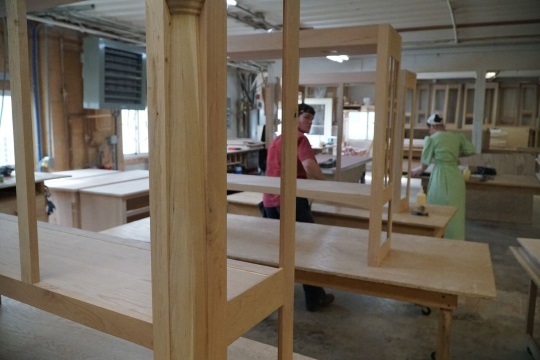 While the woodshop owners know that younger, unmarried Amish women will most likely resign to run the household once they get married, there are several reasons why the owners hire them. Jim Miller, CEO of DutchCrafters, has heard from several woodshop owners that it is because they are faster and have smaller hands for detailed work. A woodshop owner in Indiana mentioned that it’s harder to employ married men due to the RV industry in the area paying higher wages. However, the first reason he gave for hiring women is their attention to detail, a reason that was echoed by other shop owners. “They are better at catching details and small blemishes,” he said. 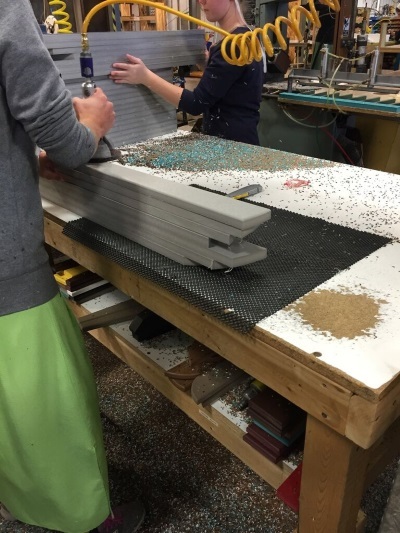 At his shop, you will see woman making raised panel doors for office furniture. And though most Amish couples follow traditional roles in marriage, they recognize each other’s skills and how to best use them. There’s a shop in Indiana that, while owned by the patriarch of the family, is run primarily by the matriarch. 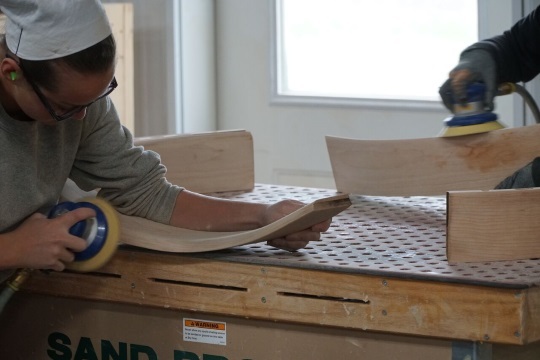 See more photos of Amish women working at woodshops on the DutchCrafters blog, Timber to Table. Milca Rivera is the marketing assistant for DutchCrafters, an online retailer of Amish furniture with a store in Sarasota, FL., where the company’s headquarters are located. DutchCrafters CEO Jim Miller, who is quoted in the piece, and his wife Linse have spent years traveling through Pennsylvania, Ohio, and Indiana Amish communities. 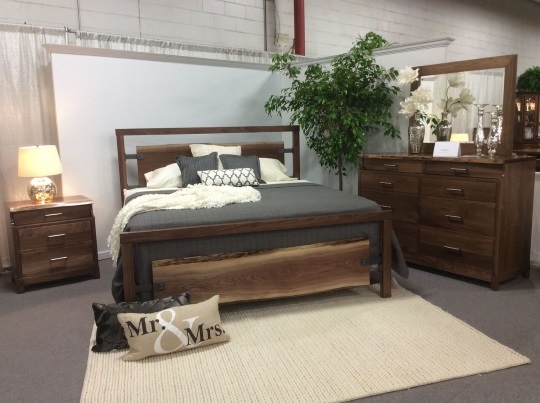 They forged and continue to build relationships with woodshops to offer custom-made, heirloom-quality, Amish crafted furniture online, and opened a store in Sarasota 2016. Are all the photos of Amish women? Interesting article, Eric. I do have a question – is the first photo of Amish women or Mennonite? The headgear make me think it may be Mennonite. Questions like this are how I learn! This is Milca with DutchCrafters. Thanks for your question. To the best of our knowledge, the women in the first photo are Amish. There are many variations of head coverings, and colors vary as well. Thanks Milca for the answer and the great photos. Sometimes Amish women will wear a cloth holding the hair back (there is probably another name for it) though that style admittedly does look more Mennonite than Amish, so I’m not surprised you were wondering. The furniture the all make is beautiful and very best quality. Love the Aish made furniture. I love the Amish made furniture but can’t afford it. Quality comes at a price and their furniture is definitely worth every penny.